Wellsboro took home at least a piece of four of the five major awards while Troy's Kyle Schucker was named the NTL Large School Player of the Year by the NTL football coaches. 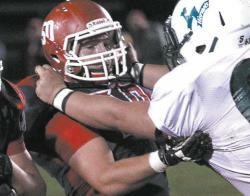 Schucker anchored the Trojan offensive line on offense and was Troy's best player defensively. The Offensive Players of the Year were newcomers this year: North Penn-Mansfield's Brock Burleigh and Wellsboro's Quinn Henry. The Defensive Player of the Year is Wellsboro's Parker Jones. The two Linemen of the Year are Wellsboro's Owen Covert and Wyalusing's Dalton Chilson. Green Hornet coach Matt Hildebrand and his staff are the Coaching Staff of the Year. Offensively for first team is Burleigh at quarterback, Troy's Ben Sherman at fullback, Wyalusing's Luke Jennings and North Penn-Mansfield's Brad Pequignot at running back, Jones at tight end, Athens' Kalen Keathley and Towanda's Steven Yates at versatility and North Penn-Mansfield's Joel Whitteker and Garrett Bickhart at wide receiver. The first team offensive linemen are Schucker (center), Chilson (guard) and Troy's Takoda Kelley (guard), Covert (tackle) and Wyalusing's Phil Kneller (tackle). The first team kicker is Athens' Austin Lister. On defense the first team tackles are Kelley, Covert and Chilson while the ends are Jones and Athens' Bill Bennett. The inside linebackers are Schucker and Athens' Gabe Sporn while the outside linebackers are Wellsboro's Nick Tremper, Pequignot and Wyalusing's Ryan Kipp. Whitteker and Troy's Hunter Cohick are the first team strong safeties while Yates is the free safety. The two cornerbacks are Keathley and fellow Wildcat Zach Sheppeck while Towanda's Tyler Basse is the punter. Second team for offense is Henry at quarterback, Tremper at fullback with Towanda's Keegan Kisner and Zach Jayne at running back. Bennett and Troy's Nate Swain are the two tight ends, Wellsboro's Chase Moser is the versatility while Lister and Brandon Lamphier are the two wide receivers. The offensive line consists of Wellsboro's Collin Pietropola (center), Wellsboro's Kaleb Smith (guard), North Penn-Mansfield's Eli Compton (guard), Athens' Avery Chandler (tackle), North Penn-Mansfield's Shane Kelly (tackle) and Towanda's Ben Jenkins (tackle). Troy's Collin Binford is the kicker. The second team defense consists of North Penn-Mansfield's Vinnie Bova (tackle), Chandler (tackle), Troy's Rob Rigby (tackle), Compton (end), Swain (end) and Athens' Luke Newman (end) on the defensive line. The linebackers are Towanda's Todd Koss (ILB), Pietropola (ILB), Jayne (OLB) and Kisner (OLB). Athens' Payton Lewis is the strong safety, Henry is the free safety, North Penn-Mansfield's Brendan Hill and Wellsboro's Alex Kozuhowski are the cornerbacks while North Penn-Mansfield's Mason Gee is the punter. Athens' Aaron Barry is the honorable mention quarterback while the fullbacks are Newman and Wyalusing's Derrick Clark. Lewis is the runningback while Wyalusing's Jon Morrison is the tight end. Frederick is the versatility pick with Troy's Alex Butcher the wide receiver. The offensive line is Sporn (center), Athens' Roger Horton (guard), Wyalusing's Dawson Otis (guard), Towanda's Mitch Peters (guard), Troy's John Terra Blanch (tackle) and Wellsboro's Ethan Nichols (tackle). The honorable mention kickers are Wellsboro's Nic Ingerick and Basse. Defensively making honorable mention are Morrison and Peters at defensive end, Towanda's Kalob Benjamin and Wellsboro's Robert Brown at inside linebacker, Wyalusing's Colin Edsell and Troy's Tristen Drake at outside linebacker, Towanda's Griffin Sites, Jennings and Moser at strong safety, North Penn-Mansfield's Judson Wise, Frederick and Athens' Justin Reagan at free safety, Towanda's Chuck Watkins at cornerback and Pietropola and Lister at punter.